The elderly are one of the most vulnerable populations in society today. Many of our elderly are not able to care for themselves or communicate effectively with those around them. This makes them an easy target to be taken advantage of as they are often at the mercy of their caretakers. Since many age-related diseases and disorders demand around-the-clock care, many families entrust their loved ones to nursing homes to provide their aging family members with the care they need. 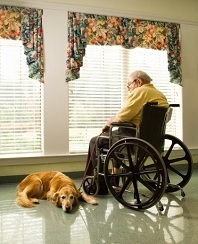 When nursing homes violate that trust and abuse or neglect those in their care, there is legal action that may be taken. TO DISCUSS A POSSIBLE NURSING HOME ABUSE CASE, CALL KURASCH & KLEIN, LTD. AT 312-372-7250 OR CONTACT US HERE. Sadly, nursing home abuse is all too common across the United States. Many nursing homes are for-profit corporations and maximize profits by hiring less qualified workers and understaffing their facilities. This accounts for much of the neglect nursing home residents encounter. And this can be dangerous-especially when your loved one’s well-being is dependent upon continual care. In addition to neglect, some nursing home workers take advantage of residents, knowing that the elderly people entrusted to their care cannot speak out against them. If you believe your loved one has been the victim of nursing home neglect or abuse, it is important to contact a Chicago nursing home negligence lawyer to see what can be done to protect the rights of your loved one. At Kurasch & Klein, we take great pride in protecting the rights of the elderly. We believe that negligent nursing homes need to be held accountable for the behavior they allow to take place within their facilities. With over 33 years of experience representing injured Chicagoans, we know what it takes to bring a successful claim against a nursing home. We use our extensive experience and deep understanding of the law to help clients recover the financial damages they need and deserve. Our attorneys are always accessible to our clients and take great care to answer questions promptly and keep clients abreast of what’s happening with their claim. Watching a loved one go through unnecessary pain is a difficult experience to go through-especially when their pain is caused by the people that are supposed to protect them and make sure their needs are met. If you believe your loved one has been the victim of nursing home abuse, contact Kurasch & Klein. Call 312-372-7250 to speak with one of our experienced Chicago nursing home abuse lawyers today.